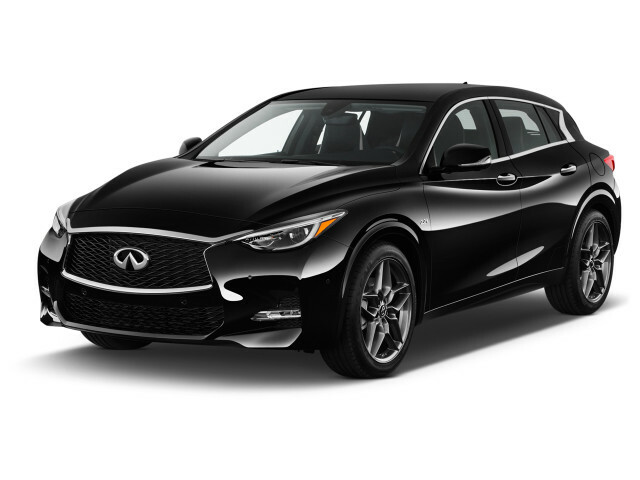 The Infiniti QX30 is a luxury compact hatchback available with all-wheel drive. It's related to the Mercedes-Benz GLA-Class and CLA-Class thanks to a production partnership with Infiniti. 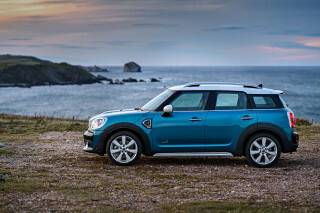 The vehicles are built at Nissan’s plant in Sunderland, England, although Infiniti emphasizes that the design, sheet metal, and cabin materials are its own. With the QX30, Infiniti has a new entry-level car that fits below the QX50 crossover. The QX30 goes up against a wide range of compact luxury models such as the BMW X1, Mercedes-Benz GLA, and Buick Encore. For 2019, the QX30 added automatic emergency braking to its standard equipment list. Elsewhere in the world, the vehicle that Americans know as the QX30 is split into two different models—the Q30 and QX30. 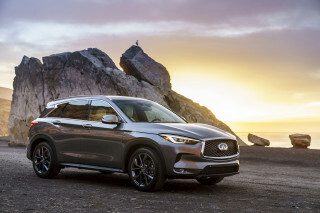 Although in other markets lower-riding, front-wheel-drive versions of this vehicle are called Q30 and higher-riding all-wheel-drive versions are called QX30, in the U.S. they're all badged QX30. The QX30 is designed to look as attractive in tight urban situations as in rural environs, and with the sort of versatility that will meet elegant luxury-vehicle needs or rugged activity-vehicle needs. The QX30 is about 174 inches long and has the parking footprint of a compact car. In all-wheel-drive models, which may be particularly appealing to those in regions with wintery road conditions, its ride height has been raised 1.2 inches, and in its lower-body treatments it gets just a little more visual ruggedness. You might even call it the QX30 AWD model an “Outbacked” version of the front-wheel-drive QX30. There's also a sporty version, called the QX30 Sport, which comes with a stance lowered 0.6 inch and more aggressive front and rear fascias, plus cross-drilled front brake rotors and 19-inch wheels on performance tires. The styling of the QX30 is quite bold, fitting with Infiniti's latest idiom. The nose is angular in side profile, but flows rearward from overhead, with nicely sculpted hood and fender lines. The design language in the QX30 is a close relationship between sharp creases and sweeping, organic surfacing. The greenhouse is short, and perhaps the most noteworthy design element is the crescent C-pillar, standing out in chrome as signature that’s echoed throughout some of the latest Infiniti models. Inside, the look heads in a different direction, too, with a broad, asymmetrical sweep across the dashboard; black cloth upholstery is standard, while leatherette and nappa leather are available. 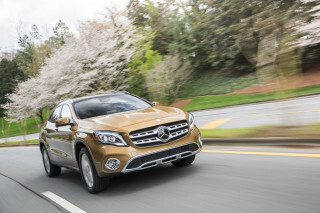 Look close enough at the dash and doors and you’ll no doubt see some commonality with the Mercedes-Benz products. 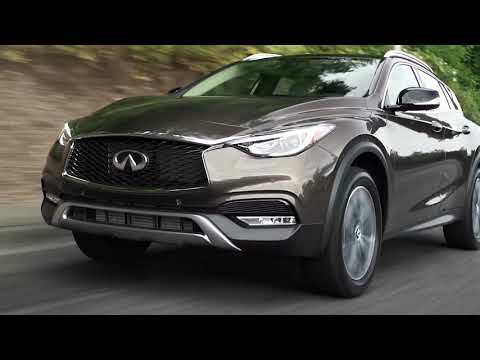 The QX30 is powered by a 2.0-liter turbo-4 that makes 208 horsepower and 258 pound-feet of torque. 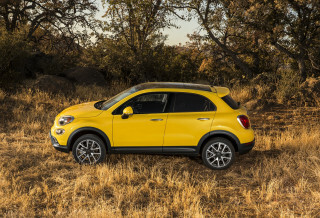 Shifts are handled by a 7-speed, dual-clutch automatic transmission, and the all-wheel-drive system can send up to 50 percent of power to the rear wheels as needed. The QX30 is offered in other markets with a manual transmission and a diesel engine, but neither are likely in the U.S. Inside, the QX30 is a relatively straightforward hatchback, with good front-seat space and a back seat that is OK for head room but a bit tight for adults in leg room and knee room. It is also almost impossible to fit three across back there. Seats in the QX30 are of note; they use a “spinal support” design that aims to closely match the curvature of the spine and more evenly distribute support throughout. Infotainment is handled by a 7.0-inch screen that accepts touch-and-swipe controls. The QX30’s safety kit includes options such as surround-view cameras, automatic high beams, an automated parking system, blind-spot monitors, lane-departure warning, adaptive cruise control, and forward collision warning with emergency braking. In its second year on sale, the 2018 Infiniti QX30 was carried over without changes from its debut a year before. For 2019, automatic emergency braking was made standard. Infiniti does not stand behind this vehicle at all. Since I own this car, I have been waiting more than 8 weeks twice to get spare parts shipped from Japan. It's ridiculous. Complained to Infiniti costomer... Infiniti does not stand behind this vehicle at all. Since I own this car, I have been waiting more than 8 weeks twice to get spare parts shipped from Japan. It's ridiculous. Complained to Infiniti costomer relationship, got very rude response. I wonder how the Infiniti can stay in business. Had rented this car for a week, and its surprisingly fun to drive, more than I wanted to admit for a "daddy's little princess" car. Girlfriend absolutely loves it. Handles great, breaking is great, the turbo... Had rented this car for a week, and its surprisingly fun to drive, more than I wanted to admit for a "daddy's little princess" car. Girlfriend absolutely loves it. Handles great, breaking is great, the turbo gives some decent power when needed. 1) A bit of view obstruction when checking the blind spot and always have to do a double take.